This is a quick help section for the HiFutureSelf app. HiFutureSelf allows you to send messages to your future self as reminders and notifictions. If your messages are not delivering, make sure your settings match the image. You can access the Settings from the "Settings" app on your home screen. Once open, scroll down and find HiFutureSelf. The settings on the left will allow HiFutureSelf to work on your iPhone. These settings are required for HiFutureSelf to function. It's completely FREE! The HiFutureSelf app is a project I enjoy working on. It's been in the App Store since 2010! Do you collect or store my personal data? No! Your messages never leave your device. Why don't my notifications show up? 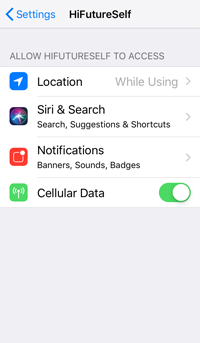 Why do notifications disappear on my iPhone? Your settings might have HiFutureSelf notifications as "Temporary" which would make them disappear even if you did not take an action. There are two types of notifications on an iOS device. HiFutureSelf uses Local Notifications. but there is also Push Notifications. Local notifications are triggered by the device itself, while Push Notifications are sent ("pushed") from a server to your device. What is a Local Notification? There are two types of notifications on an iOS device, Local Notifications and Push Notifications. Local notifications are triggered by the device itself, while Push Notifications are sent ("pushed") from a server to your device. HiFutureSelf uses Local Notifications, which means your messages are not sent to a server. They are kept on your device, and work even if you're offline. Privacy: The HiFutureSelf app uses local notifications. You don't send your data to a server. Your notification reminders and messages stay on your iPhone or iPad. Offline Operation: The app does not need an interent connection to work! Your time based notifications will trigger even if you're offline. Battery Eficiency: Since HiFutureSelf never sends data to a server or waits for a response it saves energy on your iOS device! Am I charged for notifications? There is no charge for HiFutureSelf notifications! Time based notifications do not need an internet connection! Only location based notifications require an internet connection for a map to be loaded. Time based notifications in HiFutureSelf operate completely offline! Do you store my notifications on your servers? No! Your notifications never leave your iOS device.